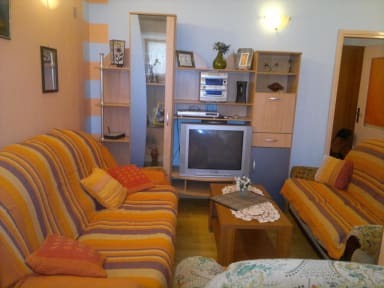 Entire home 64m2(700sqm)plus 9m2 balcony with barbecue; in the centre of the town(but very quiet) Poluotok(old part of city)on first floor.Two bedroom(equipped with two(2) single bed and one(1) double bed,satellite tv, closet and hi-fi, air conditioner)living room( big couch for two people and extra bed)) ,satellite tv, hi-fi ,air conditioner,internet,kitchen(totally equipped) and dining room,bathroom, wc and bar(pantry). Best service and quality for best price in town! !Suitable for 6 people. Fully equipped apartment,adapted and newly renovated in centre of town. FREE parking for guests who stays more then 5 days!! 2.Triple private room(two single beds and sofa bed)-when you book this room you get entire room,shared bathroom,shared living room and kitchen(use of kitchen is 7€ per day). 3.Standard 7 bed apartment-you get entire apartment. 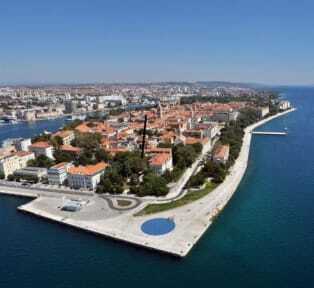 Zadar is characterized through a mild Mediterranean climate, which influences the Mediterranean vegetation, with the average July temperature of 28 C.
Famiglia adorabile e disponibilissima, camera spaziosa fresca e pulita, cucina completa di tutto, attaccato al centro e con un bel balconcino. Unica pecca il parcheggio se si è in auto: essendo in pieno centro o si pagano 20 euro di parcheggio mensile oppure 10 corone all'ora, oppure, come abbiamo fatto noi, si parcheggia ad un 20-30 minuti di distanza a piedi gratis o 3 corone all'ora. Consigliatissimo!